MODERATOR: As usual we'll start with the Secretary General, followed by President Komorowski. Mr. Secretary General. 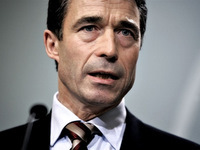 ANDERS FOGH RASMUSSEN (Secretary General of NATO): Good afternoon. First of all, I would like to warmly welcome President Komorowski to NATO Headquarters. I'm very happy to see that you, Mr. President, have chosen NATO as one of the destinations for your first official trip abroad as president. You are well known in NATO already as a strong supporter of our Alliance. You have demonstrated the strong commitment to the transatlantic community during your tenure as Minister of Defence, as well as serving as parliamentarian and chairman of the Polish Euro-Atlantic Association. And I look very much forward to cooperating with you in your capacity as president of Poland. The President and I have had a very fruitful exchange of views this afternoon. Poland is a staunch ally and I have used the opportunity today to express my strong appreciation of Poland's significant contributions to NATO missions and operations in Kosovo, in our training mission in Iraq, in our maritime missions, and notably, of course, in Afghanistan. Polish soldiers operate in the difficult east of Afghanistan. They operate without caveats. They do a great job, and we appreciate what they do in Afghanistan. Combining fighting duties with training of Afghan Security Forces. So Poland can be proud of their record in Afghanistan. And obviously the President and I have discussed at length the situation in Afghanistan, and I would like to make three points. Firstly, we are making progress in Afghanistan. Today we have cleared areas. We are holding areas where the Taliban before had the control. Today two-thirds of Afghanistan is so secure that Afghan Security Forces, supported by the international troops, can provide a sufficient degree of security for reconstruction and development. Today we have trained and educated more than 140,000 Afghan Security Forces and we will continue that build-up to a level of more than 300,000 by October next year. So we are making progress. Right now we are seeing more fights, which shouldn't be a surprise. We have sent in more soldiers, more soldiers give more fight. We are attacking Taliban strongholds. They fight back, of course. And all this gives more fights and unfortunately also more casualties, and we will see more fights in the coming weeks and months. But that's part of our strategy, to clear areas so that the Afghan government can gradually take over in the coming years. Our goal is that the Afghans can take lead responsibility themselves. We have, the international community, endorsed President Karzai's ambition that Afghan Security Forces should take over lead responsibility for the security all over Afghanistan by the end of 2014, and I hope this process will start next year. I can assure you that we will stay committed, as long as it takes, to finish our job in Afghanistan. Obviously that is not forever. We want to hand over responsibility to the Afghans and therefore we will continue to train and educate Afghan soldiers and Afghan police. Finally, we have discussed the new Strategic Concept, which will be adopted at the upcoming NATO Summit in November. Without prejudging the outcome of negotiations, I can assure you that we will reaffirm the importance of Article 5, the territorial defence, in the new Strategic Concept, while also stressing that defence and protection of our populations and our countries takes an improved capability to protect our populations against new threats like missile attacks, like cyber attacks, like terrorism. So the new Strategic Concept will reaffirm the core task, Article 5, territorial defence, but also create the framework for a modernized and renewed NATO. BRONISLAW KOMOROWSKI (President of Poland): It's a great pleasure to be able to pay the first official visit as the President of Poland here. The President, according to the Polish constitution, is also the supreme commander of the Polish Armed Forces. Membership in the North Atlantic Treaty Organization was a very important objective for Poland and we were able to attain this goal as a significant part of the element of the reconstruction of our own defence system which was connected to the requirements or the consequences of our membership in the Alliance. Today NATO assesses its own strategy. Poland wants to be an active participant of the discussion. And we want to participate at the same time in the solutions pertaining to the prospects for the important Afghan operation. Poland is consistent in her position that the sense of the functioning of NATO is given mainly by Article 5 of the Washington Treaty. NATO as a whole, and member states, must get ready for that Article. I'm glad to hear declarations that Article 5 of Washington Treaty will be fully reaffirmed, and the result of the adoption of the new strategy during the NATO Summit in Lisbon. Our position is that it should be supported also by concrete solutions which would facilitate real preparations for the fulfilment and enforcement of the provisions of Article 5. Poland has made a significant financial organizational effort in connection with the attainment to the NATO force goals and after getting a membership in NATO today we are having a problem and this is also a problem of the whole Alliance. The problem is that the costs of Poland engagement in out-of-area operations are so significant that they have a negative influence on the progress of the process of technical modernisation of our whole armed forces. It is also a problem of the Alliance as a whole. 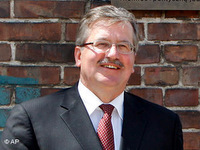 I am convinced that it is possible to find a solution which would reconcile an appropriate level of Poland's engagement in the common operation that we are having in Afghanistan within the timeframes of the agreed presence of all our troops in Afghanistan with real preparations for the enforcement of all our commitments connected with Article 5 of Washington Treaty. It seems that there is a direct connection between the strategy that NATO should adopt for the whole Alliance, and also for the concept of NATO's functioning in Afghanistan. I believe that it is an important statement that I heard that the process of that withdrawal, or decreasing the number of military troops in Afghanistan will start in 2011. This is an important statement. Poland does not change her position that we should define clearly the strategy of putting an end to the military presence in Afghanistan. We are open to a discussion. We are open to talks both about strategy and what about mission of NATO in Afghanistan and as prospects the changes and ideas, how to bring an end to it. That is why I invited Secretary General to pay a visit to Poland, and I believe that in the frameworks of the preparations for the Lisbon Treaty such mutual consultations will be continued. MODERATOR: ...heavy schedule. We have time for two questions, so Ben? Q: Ben Nimmo from the German Press Agency, DPA, over here on your left. A question for both gentlemen. On the Strategic Concept one of the main questions which has come up already is how Russia should be viewed. So a question for both of you, within the Strategic Concept, should Russia be seen as a threat or a partner or both? Thank you. ANDERS FOGH RASMUSSEN: My answer is very clear. Russia should be seen as a partner. Russia is already a partner. We have a special partnership with Russia actually. We cooperate with Russia within the NATO-Russia Council and I hope to see this partnership further develop in the coming years in the direction of what I would call a strategic partnership. I say this, while I know that we do have disagreements with Russia on certain issues, for instance, when it comes to Georgia. But it's my conviction that we should develop practical cooperation with Russia in areas where we share security interests. BRONISLAW KOMOROWSKI: Poland is involved in the construction of the mechanism of cooperation of the European Union and Russia and NATO and Russia. We can see in this an opportunity for improving the security in the whole region. Poland also gets engaged in the processes of reconstruction and development along the Poland-Russia relationship. And we also attach many hopes to that. Q: Polish Press Agency. Mr. President, I would like to ask what exactly did you tell Secretary General Rasmussen about our presence in Afghanistan? Did you quote a date of the withdrawal of Polish troops, and what did Secretary General Rasmussen respond to our arguments pertaining to the withdrawal of our troops? BRONISLAW KOMOROWSKI: Well, everybody speaks about their arguments separately, but I can tell you that yes, of course, we talked about the conditions for Poland's engagement, and also the consequences of this engagement for the Polish defence system. These are the consequences of long-term engagement and we talked about further consultations. ANDERS FOGH RASMUSSEN: Let me just stress what I said about the timetable. What I actually said is that I hope that a gradual transition to lead Afghan responsibility can start in 2011. The other element is that we have, I mean the international community, has endorsed President Karzai's ambition that the Afghan Security Forces can take responsibility all over Afghanistan by the end of 2014. What does all this mean for the presence of ISAF troops? That will very much depend on the development on the ground. My position is very clear. We must stay committed until our job is finished, and our job is finished when the Afghans can take full responsibility. MODERATOR: Thank you very much. That's all we have the time for, I'm afraid. Thank you.